South Africa head coach Rassie Erasmus has named a 20-man squad for a one-week training camp in Stellenbosch to prepare for the upcoming November series. Majority of the squad has already assembled last Sunday and it is expected that they will depart to London for their opening game of the series against England on 3rd November at Twickenham in two groups. 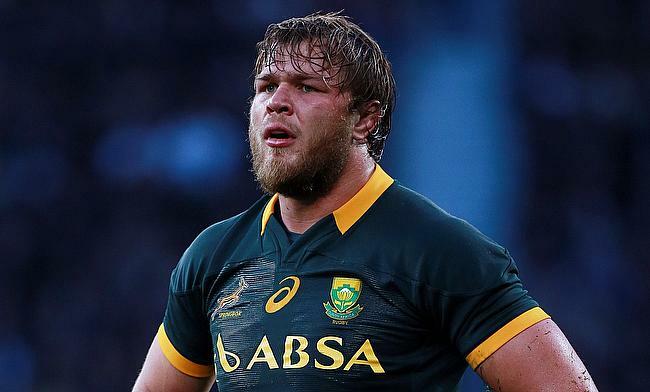 The camp includes the likes of Duane Vermeulen, who last played for the Boks in their famous 2-1 series win over England at home and Lood de Jager making a return to the squad after a lengthy injury lay-off. Trevor Nyakane is also back in the mix after missing the June series against England and the entire Rugby Championship with injury. Erasmus did include Bulls prop in the final two games of the Rugby Championship where he continued with his rehabilitation and conditioning. “It is good to welcome back a player of the caliber of Lood – he will add experience to a position where we already have some very good competition for places. Duane, of course, will also bring similar valuable experience to the group,” said Erasmus. “It’s a tough tour and our preparation time is limited, but we have set ourselves some goals and as has been the case the entire season, we would like to see the squad continue to grow as a group and add to our depth with the 2019 Rugby World Cup less than a year away". The South Africa boss also confirmed that Tendai Mtawarira will miss the end of the year due to injury while international players involved in 2018 Currie Cup final were not considered for the training squad. South Africa will play England, France, Scotland and Wales on 3rd, 10th, 17th and 24th November respectively.